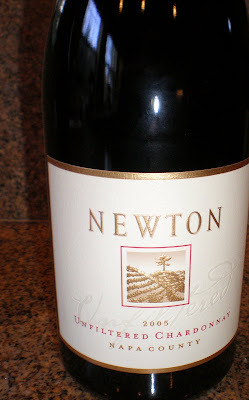 The Newton winery is recognized as an American pioneer of unfiltered wines, a philosophy that adds complexity to the winemaking process and demands meticulousness and attention to detail, but maximizes all the subtle characters of the fruit. The grapes are estate grown in the Carneros region, which are ideal for the full and rich flavors. I have been a devoted follower of the unfiltered Chardonnay for many years. One of my good friends previously worked for the winery and I attended her wedding. Of course, the Chardonnay served was the Newton unfiltered – what a treat! vanilla bean aromas, later revealing baked apple and nutty characters. full-bodied, balanced wine with a lingering creamy finish. It is aged for 20 months in French Oak.